The Hunan Garden Chinese Restaurant is known for serving all your favorite Chinese & Japanese dishes, including Kung Pao Chicken, Moo Shu Pork, Beef Chow Mein, Tofu w. Mixed Vegtable, Chicken Teriyaki, California Roll, Maki Combo, & etc. 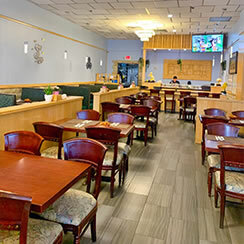 Located at 343 Mt Hope Ave, Rockaway, NJ 07866, our restaurant offers a wide array of authentic Chinese and Japanese Food, such as Kung Pao Chicken, Moo Shu Pork, Beef Chow Mein, Tofu w. Mixed Vegtable, Chicken Teriyaki, California Roll, Maki Combo, & etc. Try our delicious food and service today. Come in for an Asian Lunch Special or during evenings for a delicious Asian dinner.